Prompted by abuse claims in Philadelphia in August, a December report from now former Attorney General Lisa Madigan found that the number of abusive clergy members in Illinois is higher than reported. Madigan’s preliminary investigation found that while 185 clergy were “credibly” reported for abusive behaviors toward minors, the six dioceses in Illinois did not include the names of at least 500 additional clergy. Fr. Jeremy Dixon, a pastor at St. Vincent De Paul Parish, shares the frustration felt by survivors and advocates alike. “My hope is that this will all help to reform some of our structures in the church,” Dixon said. 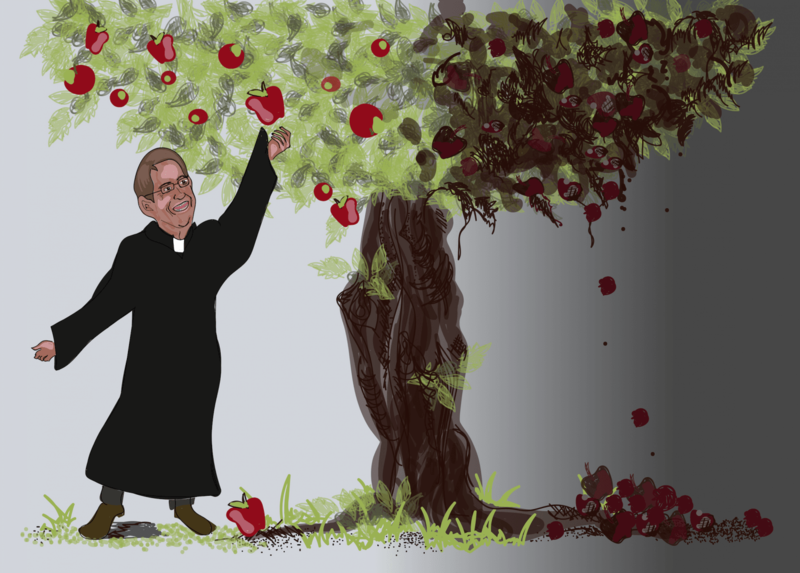 At DePaul, the largest Catholic university in the nation, professors within the theology department reflect on the history of abuse in the Church in light of the new scandal. William Cavanaugh, professor at DePaul and director of the Center for World Catholicism and Cultural Theology, shares Fr. Dixon’s belief that clericalism is the root of the scandal. “It’s responsible both for clergy who think they are entitled to prey on minors and for the bishops’ impulse to protect the clergy rather than those they abused,” Cavanaugh said. Gina Orlando, part-time faculty at the School of New Learning and member of the Encyclical Working Group, believes that the Church’s “distorted sexual message” is partially to blame. Cavanaugh also notes the sense of “déjà vu” given the Church’s history of abuse. The United States Conference of Catholic Bishops (USCCB) created the Charter for the Protection of Children and Young People in 2002, which focused on creating safe environments, healing for survivors and disciplining perpetrators. Amidst this renewed scrutiny, nearly 130 officials will meet in Rome on Feb. 21 to 24 to assess current policies and propose new means of prevention. Currently, the Office for Protection of Children and Youth (OPCY) handles abuse within the Archdiocese of Chicago. Four subdivisions allow officials to navigate the different components of such cases: the Office for Abuse Investigations and Review, Office of Assistance Ministry, Safe Environment Office and Prayer and Penance Program. The Safe Environment Office, led by Director Mayra Flores, focuses on the suitability of all individuals who work within the organization. All employees, volunteers and clergy members must sign the Code of Conduct form, which is the basis of the screening process, prior to employment. Name-based background checks, fingerprinting and Child Abuse and Neglect Tracking (CANT) forms comprise the screening process for employees and volunteers; however, clergy members are exempt from the fingerprinting portion, but are subject to all other screening components. Following screening, individuals participate in Virtus, Mandated Reporter and children’s training. Virtus educates individuals over 18 on methods perpetrators take to gain access to children. Mandated Reporter training, also for adults, introduces state laws and means of reporting abuse. Children’s training is required for all age groups in every school, parish and religious education program, and focuses on recognizing signs of sexual abuse and teaches children how to report instances to adults. The Office for Child Abuse Investigations and Review, led by Director Leah McCluskey, handles allegations of sexual abuse against any individual within the Archdiocese. When an alleged victim comes forward, McCluskey sets up an in-person meeting with the individual and a representative from the Office of Assistance Ministry—which provides support to survivors of abuse—to formalize allegations. The office then proceeds with their investigation of the claim and works closely with the Independent Review Board. The Board is an advisory group of the Cardinal comprised of nine to 11 individuals. Six of the members are not employed by the church in order to have an outside perspective. These individuals inform different components of the case, as they are a psychiatrist, a psychologist or social worker, an attorney, a parish council member, a parent and a victim/survivor or a parent of a victim/survivor, according to the Archdiocese’s website. The list, updated in November 2018, lists 71 archdiocesan clergy members with substantiated claims of abuse. In regard to the December report, McCluskey said that the office’s legal department was in direct contact with Madigan’s office throughout the investigation. Unable to comment on specific changes, McCluskey and other officials within the office await the implementation of policies to be discussed at the summit at the end of the month while performing annual audits. Cavanaugh says that while proactivity in the Church has increased, much more work needs to be done.